Christopher, my husband, is completely opposite of me when it comes to food. He’s such a picky eater and I complain all.the.time. about it. It’s so boring eating the same things over and over. So, I was browsing through Pinterest looking for some recipe inspiration and that’s when it hit me. 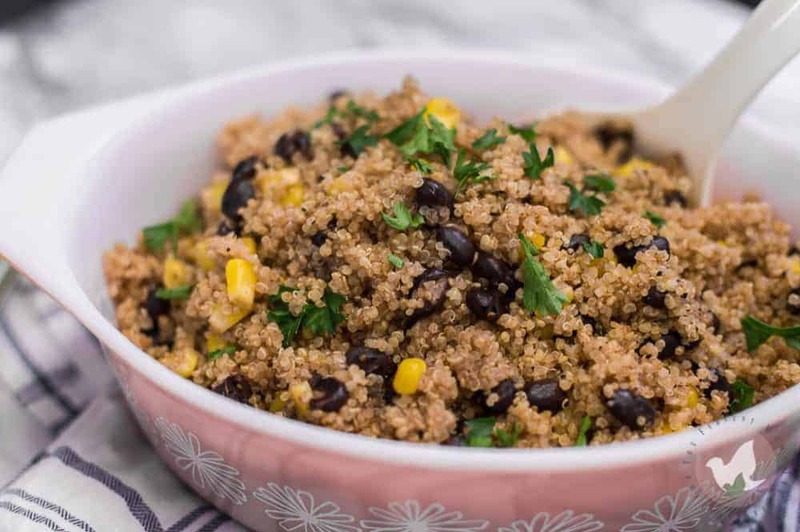 Mexican Quinoa Bowls. Of course, he wasn’t too keen on trying it out, but it’s a winner in my book! Another dump-and-run recipe that is perfectly crafted for the busy family. Easy, quick, delicious is always the way to go. Plus, you probably already have all the ingredients in your pantry. 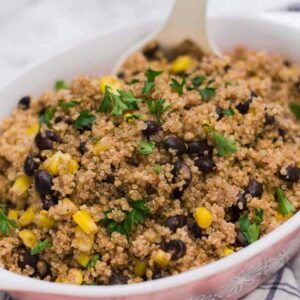 These Pressure Cooker Black Bean and Corn Quinoa Bowls will be the next thing you add to your menu plan! 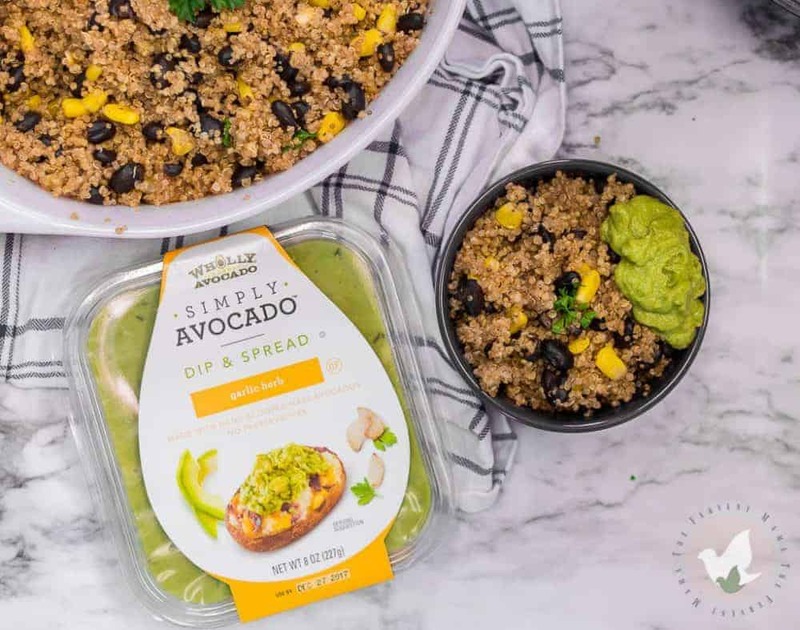 To top it all off, we’ve added a little Mexican flare to a simple dish giving it a kick of fiesta with seasonings like cumin and chilli powder (we’re using our homemade taco seasoning) and toppings like WHOLLY® SIMPLY AVOCADO™, which gives the convenience of a fresh avocado without all the fuss, and/or salsa. 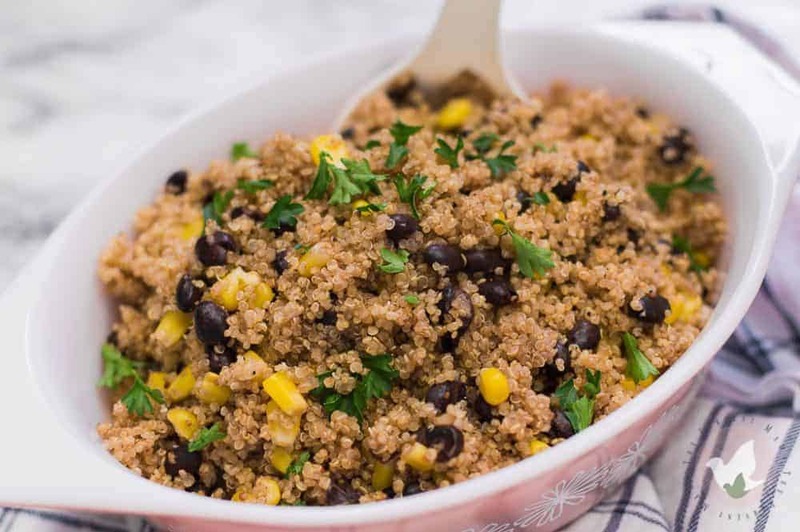 In my opinion, even though quinoa is a superfood, by itself it can be a really bland grain with woody undertones that can sometimes be overwhelming. But when you know how to cook it, which we think we’ve mastered here, it really is delicious! You need just a few main ingredients; quinoa, stock or broth (our homemade pressure cooker bone broth is amazing! 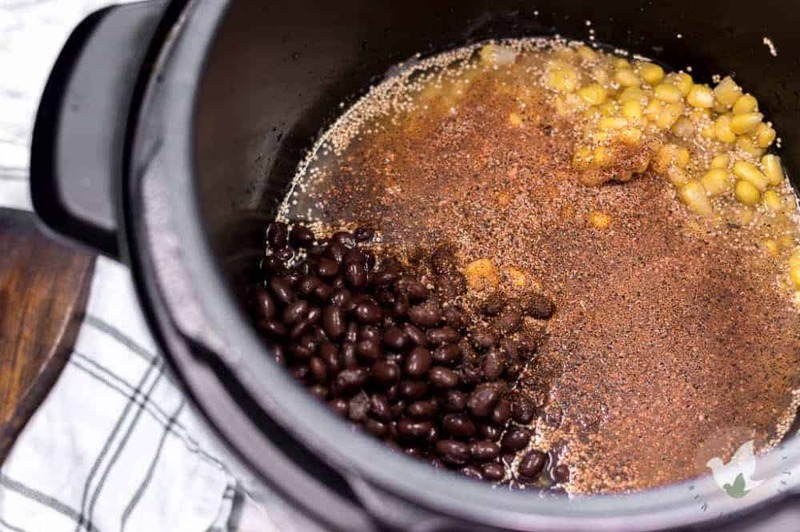 ), canned black beans, and frozen corn. I know it sounds super crazy, but we’re only cooking the quinoa for one minute. High pressure for 1 minute, then a full natural release allows the grain to pop open but stay intact, which is just what you want. For seasonings, we suggest our homemade taco seasoning, but you can substitute your favorite store brand if you prefer. Next, we move into my favorite part of the dish, toppings. I like to fold in a little fresh parsley, some canned chicken breasts (for a heavier option), a good chunky salsa, and definitely SIMPLY AVOCADO™. 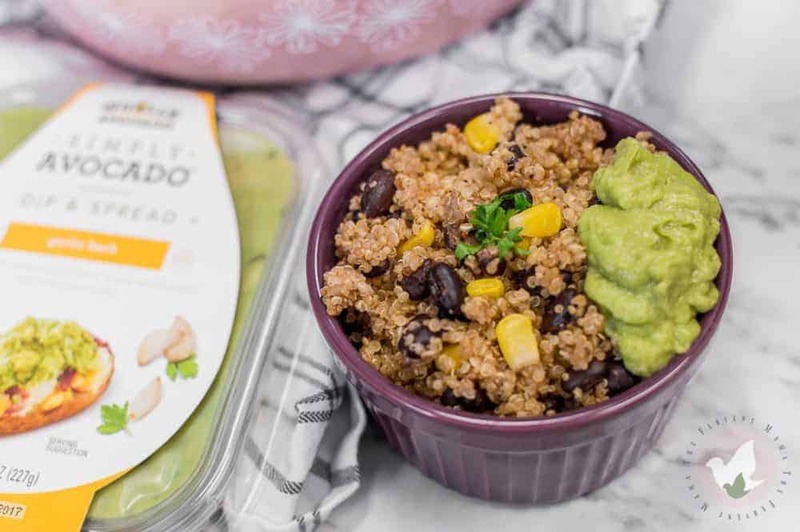 We opted for the WHOLLY® SIMPLY AVOCADO™ Garlic and Herb for these pressure cooker black bean and corn quinoa bowls and couldn’t be happier with the choice! It was so easy to grab while I was at Walmart. 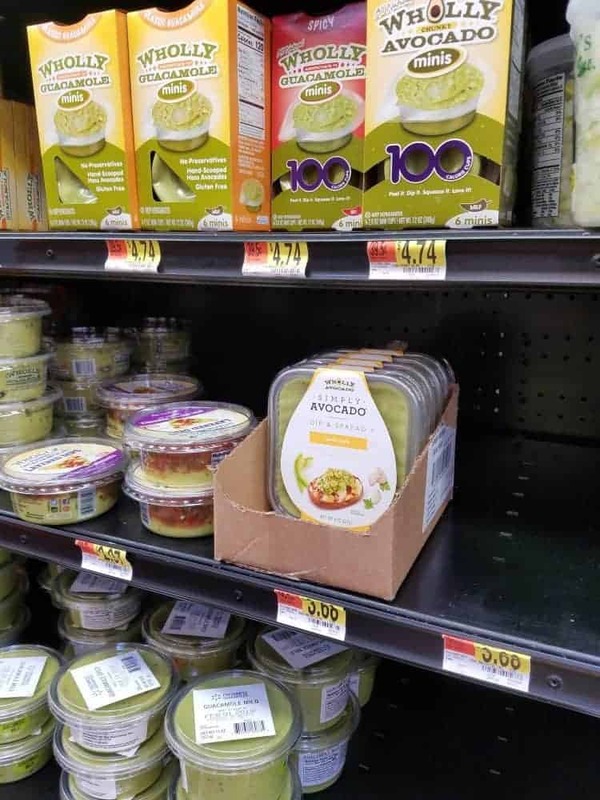 SIMPLY AVOCADO™ is a pure, wholesome avocado dip and spread with minimal flavor enhancing ingredients. The convenience substitute for fresh avocado. Easy, quick, and delicious is always the way to go. 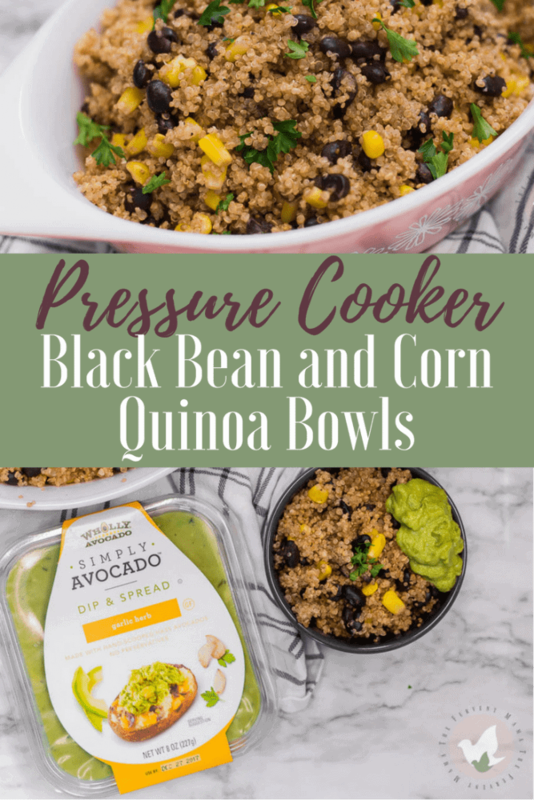 These Pressure Cooker Black Bean and Corn Quinoa Bowls will be the next thing you add to your menu plan! A simple dish with a Mexican flare to give your supper a little fiesta! 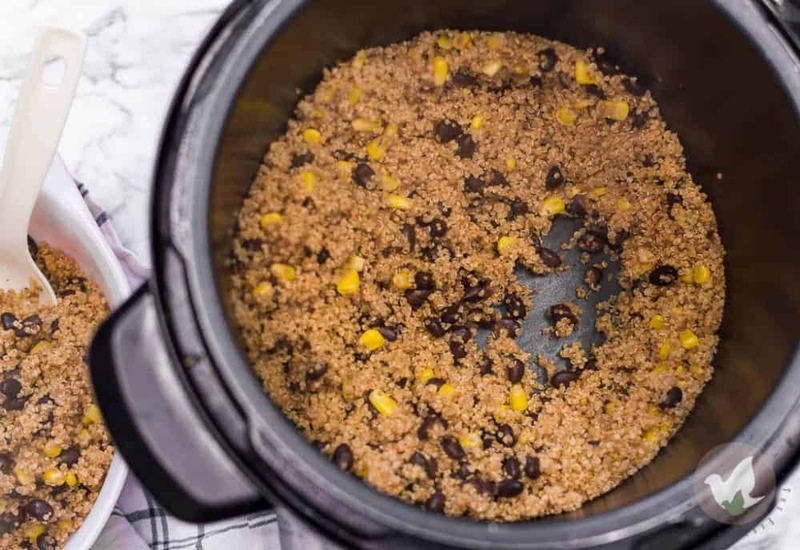 Into your pressure cooker, add quinoa, chicken broth, corn, black beans, and taco seasoning. Close and lock lid. Cook on HI pressure for 1 minute. When the timer goes off, unplug the pressure cooker and let it perform a natural release (at least 10 minutes). When the natural release is complete fluff with a fork. Top with your favorite ingredients like fresh parsley, sour cream, chunky salsa, and your choice of WHOLLY® SIMPLY AVOCADO™ in Sea Salt or Garlic & Herb flavors! Don’t forget to join our Facebook Group Pressure Cooker Family Recipes to join a community of people who love their magic pots, I mean pressure cookers, too! Feel free to share your favorite recipes, ask questions and make friends!